Today is Elvis Presley’s birthday — a perfect time to present a nostalgic look back at the early days of his fame, before he broke nationally and when it was still pretty easy to get a ticket to see him. 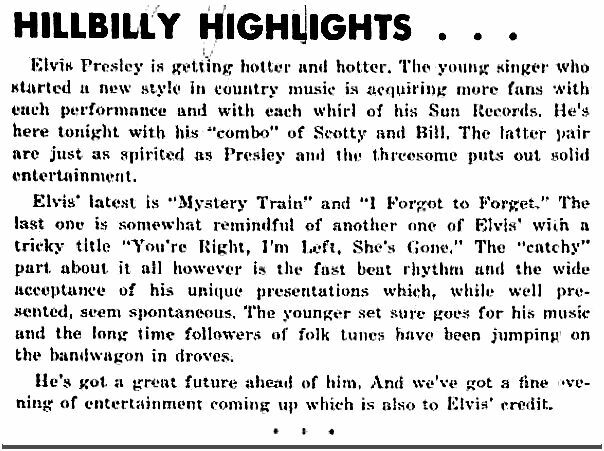 Here are a few tidbits from his appearance on Sept. 3, 1955 at the legendary Big D Jamboree (held at the equally legendary Sportatorium). Happy Birthday, E! 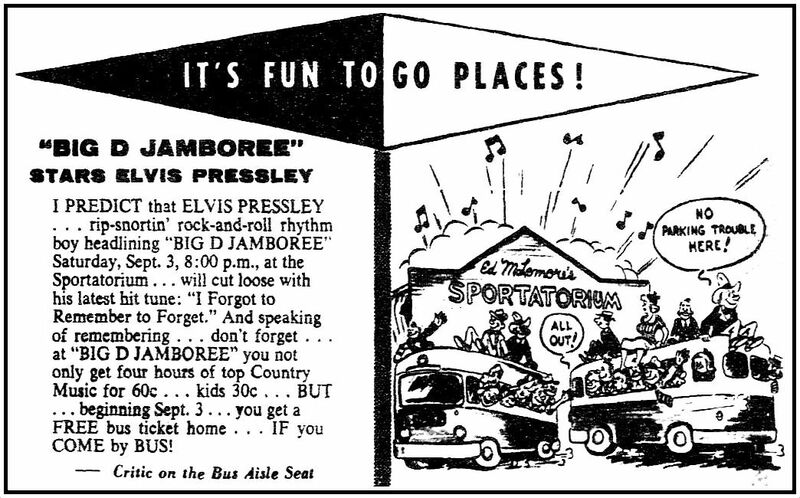 Photo of Elvis and the two clippings from the Big D Jamboree program to that night’s show, Sept. 3, 1955 (which the ad is promoting). That twas what I was telling everyone over the years great you go this one, you know i had too go over there when they tore that place down and it was sad it was a landmark and look at that area today, nothing/……You have Elvis sittings and you have Picasso sittings…..while in Dallas we may be Rome in tearing it all down, we are image rich to see that it took place….. The Belew Twins were standing in the wings watching Elvis and realizing their time of being the young rock n roll hotties was coming to an end. I was there that night, Elvis came out in a pink satin shirt with black satin pants, (unheard of at that time) and sang Blue Moon if Kentucky, rock a billy style. I loved him, but some of the people in the crowd tried to throw things at him. His way of singing, plus his hip gyrations, were just a little too much for a Dallas conservative crowd. Believe this was his first appearance, about 1955. That is so cool. I can’t even imagine what it must have felt like to see him for the first time. My father told me about a couple of his SMU fraternity brothers who had gone to see him at the Sportatorium and couldn’t stop talking about the experience for a week.